Huawei announced two variants of the phone P10 and P10+, the successors of P9. P10 will be with a 5.1 inch Full HD display and P10+ will come coming with a 5.5 inch Quad HD display. The difference between these two are not only in the screen size, the battery capacity, RAM and storage capacity are also different. P10 and P10+ will be having Kirin 960 processor, Octa-core (4x2.4 GHz Cortex-A73 & 4x1.8 GHz Cortex-A53) and Mali-G71 MP8 GPU. Both Phones will have a hybrid SIM slot which you can use to increase the storage space or to use a second SIM card . The phones looks similar to iPhone now. P10 comes with 5.1 inch FHD display with 1080 x 1920 pixels resolution and Corning Gorilla Glass 5 protection. It will be having 4GB of RAM and 64GB of internal storage. The battery size will be 3200mAH with Super charge support. Dual Rear cameras with f.2. aperture. P10+ will be having 5.5 inch QHD display. P10+ will have 2GB more RAM than P10, that is it will have 6GB of RAM and also double storage space than P10 (128GB of internal storage). The device will be powered by a 3750mAH battery. Dual Rear camera with a wider f1.8 aperture compared to P10. There will be two cameras on the rear, where one will be a 20 Megapixel monochrome one and another is 12MP with color sensor. Front shooter will be a 8MP one with f1.9. Both phones will be running on the Android Nougat 7.0. and will have Fingerprint , accelerometer, gyro, proximity, compass sensors. P10 is priced at €649 ($685) approximately INR 45,000, while the P10+ is priced at €699 ($738) approximately INR 49,000. 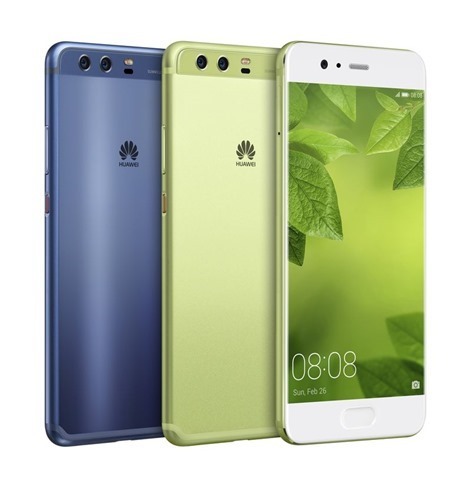 Huawei Announced two Android smartphones, P10 and Huawei P10+.